57Now the time came for Elizabeth to give birth, and she bore a son. 58Her neighbors and relatives heard that the Lord had shown his great mercy to her, and they rejoiced with her. 59On the eighth day they came to circumcise the child, and they were going to name him Zechariah after his father. 60But his mother said, “No; he is to be called John.” 61They said to her, “None of your relatives has this name.” 62Then they began motioning to his father to find out what name he wanted to give him. 63He asked for a writing tablet and wrote, “His name is John.” And all of them were amazed. 64Immediately his mouth was opened and his tongue freed, and he began to speak, praising God. 65Fear came over all their neighbors, and all these things were talked about throughout the entire hill country of Judea. 66All who heard them pondered them and said, “What then will this child become?” For, indeed, the hand of the Lord was with him. Just before the birth of Jesus is another birth. We are back in Luke and will be for today and tomorrow. 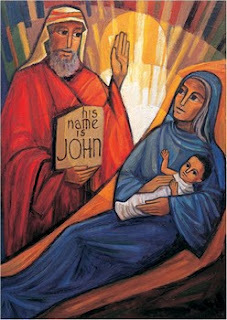 John is born just a few verses before Jesus in the book of Luke. So often we overlook this birth but this birth is almost as important as another birth. John prepares for Jesus. John’s birth is even as miraculous as Jesus’ birth. His dad has been silent all this time and starts to talk again with his naming. His a most welcome baby into the world. What is so unique about this story is found in the naming of John. Once Zechariah starts speaking again, the first thing he says is the name. In the Jewish culture, naming is a big deal. The naming comes days after the birth of the baby. It is a communal event to name. The name John doesn’t come from anywhere but God for this family. People are amazed that they would even think of it! Usually names come from others in the family or from history and this came comes out of left field. In fact, people think Zechariah and Elizabeth are totally crazy for naming in this way. But there are bigger things afoot and John must carry his name and fulfill what he is to do. The name John in Hebrew means that God has been gracious to God’s people. God has shown favor. John’s name is as important as Jesus’ name which means God with us. Names represent something to their people. Names help them carry out what their life is to be. We are all named as well. There was intention to the name given to you. There was probably some ritual of some kind to name you. Some discerning. I know that my parents were debating about Courtney or Heather as my name. They wanted a strong woman’s name so that I might carry that strength. By the way, I am so glad that they went with Courtney rather than Heather. Heather? Really? I feel as though part of who I am is living into my name. For scripture, naming is a major part of the birth stories. What John and Jesus are named changes the surroundings. Changes the message and gives hope to the people around them. They will live into those spaces. What does your name mean? How have you lived into your name? How does it connect you to others around you and help you to find who you are? Christy Carol for Christmas Carol because I was born on Christmas eve. My siblings had the honor of naming me. They were 10, 12, & 16 when I came along. It was their way of welcoming this “pleasant surprise” to the family.